When Starwood and Marriott merged last fall, many in the industry were surprised by the speed with which reciprocal benefits were offered to members of each respective program. On day one, accounts could be linked to transfer points and match elite status. Although members cannot pool stays or nights to achieve elite status in a single program, status earned in either is immediately matched. Points can also be pooled to redeem across all brands in the new combined company. Both programs generally had properties in each North American state (with one notable exception), though Marriott’s brands had much deeper reach into smaller and more remote communities. In the Asia/Pacific region, Starwood has significantly more impact and will be the first to open a property in New Zealand—a Four Points by Sheraton in Auckland, during November 2017—although Marriott brands are slated to follow. Members previously concentrating their bookings to either company will see new destinations come online in both programs to earn points and redeem for free stays. The following popular destinations are those that had Starwood-branded properties prior to the merger and which are now available for earning and redemption in the existing SPG program. Marriott Rewards members can transfer earned points to their account or transfer Marriott Rewards points to SPG to redeem for award stays. Just eight hours from Los Angeles by air, French Polynesia gets the same number of visitors in a year that Hawai‘i does in just a few days. Visitors to the islands of Tahiti can enjoy crystal clear lagoons, fresh seafood and discover the life force known to the Tahitians as mana. SPG participating properties in French Polynesia include the Le Méridien Tahiti on the island of Tahiti, and two properties on legendary Bora Bora: The St. Regis Bora Bora Resort and the Le Méridien Bora Bora. Award stays are available for as little as 36,000 Marriott Rewards points transferred to SPG. The Dutch/French Caribbean island of St. Martin/Sint Maarten is another destination that is new to Marriott Rewards. The island boasts an international visitor appeal, sophisticated European vibe and one of the world’s most stunning air approaches: Jumbo jets virtually kiss the surf and sand of Maho Bay before touching down at Princess Juliana International Airport on the Dutch side. The Westin Dawn Beach Resort & Spa is also the only SPG participating property on the island: Guests can sun at an infinity pool just steps from a white sand beach massaged by aquamarine wavelets. Award stays start at 36,000 Marriott Rewards points transferred to SPG. The Asia-Pacific Region is one of the crown jewels in the former Starwood’s portfolio, and the western Pacific, U.S. territory of Guam is popular with adventuresome North Americans as well as with visitors from many Asian countries as a closer beach alternative to Hawaii. There are two SPG participating properties on Guam: the Sheraton Laguna Guam Resort and The Westin Resort Guam. The former is a Category 4 property with SPG, which means award nights start at 30,000 Marriott Rewards points transferred to SPG. The Le Méridien Ile Maurice starts at 21,000 Marriott Rewards points transferred to SPG. Other properties include the St. Regis Mauritius Resort, Shanti Maurice – A Nira Resort, St. Félix, A Member of Design Hotels™, and The Westin Turtle Bay Resort & Spa Mauritius. There’s also a Sheraton Resort with associated residences in the development pipeline, though it is not yet accepting reservations. Iceland is a new destination to Marriott Rewards, but it’s also a relatively recent addition to SPG. Both of the properties in Iceland belong to the Design Hotels brand, which is a newcomer to the SPG program with somewhat more limited participation. That said, Iceland is a hot item on many travel wish lists. It’s worth noting that the redemptions at both the ION Adventure Hotel in Nesjavellir, and the 101 Hotel in Reykjavik are at Iceland-appropriate pricing. At Category 6 in the SPG program, it’s at least 60,000 Marriott Rewards points transferred in for a free night. The following popular destinations are those that had Marriott-branded properties prior to the merger, which are now available for earning and redemption in the existing Marriott Rewards program. SPG members can transfer earned points to their account or transfer SPG points to Marriott Rewards to redeem for award stays. In addition to Aruba, the entire chain formerly known as the Dutch Lesser Antilles seemed almost entirely overlooked by SPG, while Marriott had a brand presence on each of the ABC Islands of Aruba, Bonaire and Curaçao. (Aruba is independent, Curaçao nearly so, while Bonaire has elected to remain part of the Kingdom of the Netherlands). On Aruba, Marriott boasts no less than five properties ranging from the energetically contemporary Renaissance Aruba Resort & Casino in the heart of Oranjestad’s shopping district to the lavish Ritz-Carlton Aruba. The Renaissance property, at Category 8, is available to SPG members for redemption by transferring as little as 11,666 SPG points to Marriott Rewards at the PointsSavers level, or 13,333 for a standard reward. The European-style AC Hotel Bella Sky Copenhagen sits in a residential area convenient to transit from both Copenhagen city center and the airport. The centrally located Copenhagen Marriott Hotel is right on the city’s waterfront. Redemptions for SPG members begin at the Category 6 AC Hotel, which requires as few as 8,333 Starpoints transferred to Marriott Rewards at the PointSavers level, or 10,000 for a standard reward. 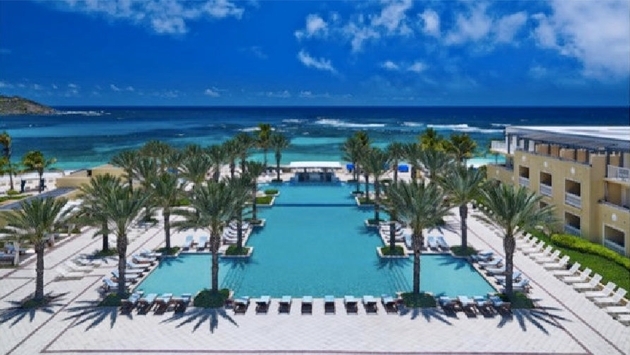 The Bahamas was another big gap in the SPG portfolio, but like SPG in Iceland, Marriott’s presence in the Bahamas is relatively new, with the island’s largest resort, Atlantis, having just joined Marriott’s Autograph Collection. Atlantis’s five distinct towers are available at a number of redemption tiers. The more intimate French Leave Resort is also part of the Autograph Collection, and there’s a Courtyard property in downtown Nassau as well. Redemptions for SPG members begin at the Category 6 Courtyard, which requires as few as 8,333 Starpoints transferred to Marriott Rewards at the PointSavers level, or 10,000 for a standard reward. While coverage between SPG and Marriott Rewards-participating properties generally extends to all of the 50 states, Wyoming was the one exception. While SPG participating properties tend to favor larger cities and Marriott’s brands are more often found in rural areas, the Equality State is without large cities, and thus is home to no less than 13 Marriott-branded properties but nary an SPG one. And redemptions for SPG members are a steal: the Fairfield Inn and TownePlace Suites properties in Gillette are available for as few as 2,500 Starpoints transferred to Marriott Rewards at the PointSavers level, or 3,333 for a standard reward. Where Starwood is the envy of other hotel brands in Asia-Pacific, Marriott is the same in Africa—it even has an entire homegrown brand with more than 100 properties on the continent. There are six Protea hotels in Namibia, from tranquil lodges on the Zambezi River to gracious resorts overlooking the rugged coast near Walvis Bay. Most of them are a bargain, too: Five of the six are Category 1 properties, available for as few as 2,000 Starpoints transferred to Marriott Rewards at the PointSavers level, or 2,500 for a standard reward. Moving forward, whether Marriott Rewards and SPG are combined into a giant mega program (as Marriott has said is the plan, although I’m personally pretty satisfied with the current arrangement) or not, there are very few areas left on earth which don’t have at least one property available for earning or redemption with either program.